The primary function of EstroQuench™ is designed to quench excessive production of estrogens and aberrant functions of them while supporting optimal function of androgens by maintaining the health of androgen producing glands. The ingredients inside EstroQuench™ is documented to have anti-aromatase activity as well as androgenic adaptogens which support the function of endogenous aromatase inhibitors. Collectively these herbs promote minimal production and function of estrogens, while promoting testosterone function, including optimal sexual function in both genders. This Hormone Specific Formulation™ is provided by Douglas Laboratories® and formulated by Dr. Joseph J Collin. It is created to support the optimal function of specific hormones through the use of hormone specific adaptogens, hormone specific agonists and hormone specific functional mimetics. 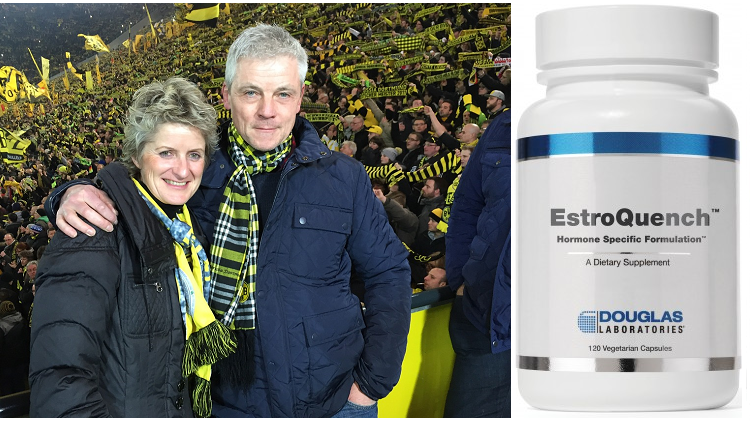 EstroQuench™ is used by healthcare professionals to reduce estrogens levels by inhibiting aromatase activity, which will decrease the conversion of androgens (testosterone and androstenedione) to estrogens (estradiol and estrone). Women who want lower estrogen levels, to decrease breast cancer risks or with breast cancer therapy. Men who want lower estrogen levels to, decrease prostate cancer risks or with prostate cancer therapy. Women who want to overcome estrogen dominance, and improve their Progesterone to Estradiol Ratio. Men who want to overcome estrogen dominance, and improve their Testosterone to Estrogen Ratio. Men who are infertile with a low serum testosterone-to-estradiol ratio can be treated with an aromatase inhibitor . Patients who are on Testosterone Replacement Therapy (TRT) and want to decrease the conversion of testosterone to estradiol. Men on TRT who want to prevent the development of gynecomastia or prostate disorders. Male athletes who want to maintain proper Testosterone to Estrogen Ratio. Brueggemeier RW. Aromatase inhibitors: new endocrine treatment. Semin Reprod Med. 2004 Feb;22(1):31-43. Review. Lew R, Komesaroff P, Williams M, Dawood T, Sudhir K. Endogenous estrogens influence endothelial function in young men. Circ Res. 2003 Nov 28;93(11):1127-33. Epub 2003 Oct 30. Gonzales GF, et al. Effect of Lepidium meyenii (MACA) on sexual desire and its absent relationship with serum testosterone levels in adult healthy men. Andrologia. 2002 Dec;34(6):367-72. Ye L, Chan FL, Chen S, Leung LK. The citrus flavonone hesperetin inhibits growth of aromatase-expressing MCF-7 tumor in ovariectomized athymic mice. J Nutr Biochem. 2012 Oct;23(10):1230-7. Bajgai SP, et al. Hybrid flavan-chalcones, aromatase and lipoxygenase inhibitors, from Desmos cochinchinensis. Phytochemistry. 2011 Nov;72(16):2062-7. Grube BJ, Eng ET, Kao YC, Kwon A, Chen S. White button mushroom phytochemicals inhibit aromatase activity and breast cell proliferation. J Nutr. 2001 Dec;131(12):3288-93. Brueggemeier RW, et al. Molecular pharmacology of aromatase and its regulation by endogenous and exogenous agents. J Steroid Biochem Mol Biol. 2001 Dec;79(1-5):75-84. Balunas MJ, et al. Isolation and Characterization of Aromatase Inhibitors from Brassaiopsis glomerulata (Araliaceae). Phytochem Lett. 2009 Feb 19;2(1):29-33. Tambi MI, et al. Standardized water-soluble extract of Eurycoma longifolia, Tongkat ali, as testosterone booster for managing men with late-onset hypogonadism? Andrologia. 2012 May;44 Suppl 1:226-30. Balunas MJ, Su B, Brueggemeier RW, Kinghorn AD. Xanthones from the botanical dietary supplement mangosteen (Garcinia mangostana) with aromatase inhibitory activity. J Nat Prod. 2008 Jul;71(7):1161-6. Adams LS, et al. Pomegranate ellagitannin-derived compounds exhibit antiproliferative and antiaromatase activity in breast cells in vitro. Cancer Prev Res (Phila). 2010 Jan;3(1):108-13. Rinwa P, Kumar A. Quercetin along with piperine prevents cognitive dysfunction, oxidative stress and neuro-inflammation associated with mouse model of chronic unpredictable stress. Arch Pharm Res. 2013 Jul 16.